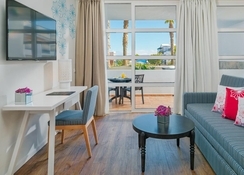 The H10 Rubicón Palace is a 4-star resort located in Playa Blanca, in the south of Lanzarote. Overlooking sweeping beaches and a promenade, the hotel is built around a huge landscaped garden and is divided into complexes of large villas and bungalows. You will find upbeat restaurants and a cluster of shops around the hotel. For more options, you can walk into the city centre, which is 3km away. A rocky beach is right behind the hotel and the sandy beach of Flamingo is 2km away from the hotel. See more of the island by venturing out to the nearest town in Playa Blanca, just a five minute ride in a taxi. 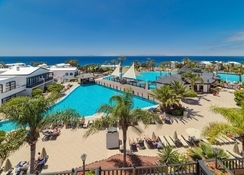 Special landmarks to visit include Dorada beach (4km), Papagayo beach (7km), Calle Limones – shopping area (3.5km), Timanfaya National Park (20km) and Arrecife (40km). Lanzarote Airport is 35km from the hotel. Expect a gorgeous balcony or terrace and air-conditioning in all of the hotel’s 593 rooms. Choose from a double or twin rooms with garden views, or for a little extra, some twin rooms come with sea views. You can upgrade your twin room to a superior or to Privilege rooms, which come with access to the Privilege lounge. Designed to offer guests a memorable stay, rooms come furnished with en-suite bath amenities, air conditioning, a coffee maker, mini work station, sofa/couch, mini fridge, safe deposit box, WiFi internet, hairdryer and more - note that you might have to pay locally to use some of the features. Clean and spacious, housekeeping provides fresh towels and bed linen daily. The hotel features seven restaurants and two bars. 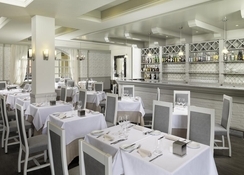 El Volcán – Privilege Restaurant serves breakfast and dinner, Dolce Vita serves authentic Italian cuisine in the evening, La Choza Pool Bar and Sakura offer the taste of Asian cuisines and Steakhouse for American. Furthermore, Janubio and Tabaiba are two main restaurants serving breakfast, lunch and dinner in buffet style meals. At lunch and dinner, cocktails are served if you so desire. Buffet restaurants also feature theme dinners and live cooking stations regularly to please every taste. Do make reservations to dine in the a la carte restaurants to avoid disappointment. In addition, there are two bars, the Montana Roja Disco Bar and Beefeater Sports Bar, where you can enjoy local specialities, wine, cocktails, mocktails, and other alcoholic and non-alcoholic drinks. 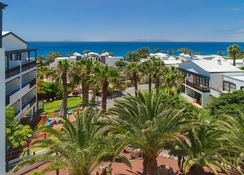 H10 Rubicon Palace boasts five sparkling swimming pools for adults (1 heated in winter and 1 salt-water) and three paddle pools for kids (2 heated in winter). Rejuvenate yourself at the wellness centre with a Jacuzzi, Turkish bath, sauna, hydro-massage beds, pebble passageway, nebulised water cubicle, hairdressing service, or body/facial massages/treatments. Please note you might have to pay to use these facilities. Children can join their respective clubs - baby club (6 months to 3 years), mini club (4 to 8 years), junior club (9 to 12 years), teen club (13 to 16 years) and Daisy Adventure. There are various live events, performances and entertainment too. For outdoor enthusiasts, up the adrenalin factor with water games, football, archery, shooting, water polo, basketball, gymkhanas, and more. We stayed at The H10 Rubicon Palace at the end of October/beginning of November. Yes there were building works going on to improve the hotel but what we experienced was 5 star. We were half board and wish would had gone all inclusive as we didn’t leave the resort half as much as we thought we would! The kids clubs were brilliant and well thought out. There are various pools dotted around the resort but not far to walk at all. Unless your lazy! The reception area is amazing, and the piano bar in the evening was truly relaxing. Lack of reception staff was one issue I have to point out like so many others. In the piano bar they Could improve on the cocktail menu in my opinion though. Our room was the far end where the building work was going on and was definitely not 5 star but we slept well, were comfortable and new it was being upgraded soon but this didn’t effect our stay as we were hardly in our room anyway. Food was delicious, and plenty for everyone. Yes you have your rude europeans like you do everywhere who don’t know what a queue is but this isn’t the hotels fault. I’d go back again without a doubt. We had a wonderful week in sept our first time staying in this hotel the staff were so helpful ,security staff ,bar staff ,all couldn’t do enough to make our stay so comfortable .food excellent,house maids very kind offering extra help if required ,we will repeat our stay ASAP with extra family members next time I would highly recommend this hotel to anyone wanting high standards ,great customer care and excellent food .hotel management please take note more toilets needed outside near pools .thank you for a wonderful stay we will be back . We’ve been here now 4 times show that tells you how much we like it. We’ve had the privilege package 3 times and was fabulous but due to recent pricing tried the all inclusive and have to say we didn’t miss the privilege too much. Great food, there’s always lots to choose. Nice location that has a lovely coastline walk. Dissapointed that the spa closed during the week we attended. Only critiscism would be to shake up the evening entertainment as it can be dated. However we’ll be returning soon hopefully. 1st time in Playa Blanca really enjoyed the peaceful area with great walks along the seafront.The Hotel has recently been upgraded to 5* it the main areas are tastefully decorated with plenty of comfortable seating inside and out which is a rare thing .Our room was massive with great views ,the food varied only problem was getting tea coffee during for 2 machines as the waiting staff couldn't cope at breakfast time.The drinks on the All Inclusive were branded and cocktails galore .Would recommend . The most beautiful hotel. Food excellent, staff wonderful. My daughter and I had a week here in October - we didnt want to leave. We would go back again for sure. Excellent hotel with all the facilities you could want. Would have scored higher if not for the fact that sun loungers sat all day with towels on them even though this was against hotel rules. Also the availability of specialty restaurants was poor. You really have to book as soon as you check in or you might not get a table.